Today – a single, bold, beautiful purple tulip. We really do respond to the seasons. Your tulips are beautiful, Jodi! Yesterday’s and today’s. Come on Spring!! Gorgeous tulip – I love the paint splatters too. Thank you Hannah! I love to splatter – LOL! Nice! Love this one, Jodi! Beautiful, Jodi!! I love your poem too but the tulip is just gorgeous!! LOL! That spring fever is here in the southwest too! haha! Makes drool for spring, beautiful just beautiful. Such a lively tulip and so fresh! Nice, Jodi!! Thanks so much Cynthia! 🙂 I’ve got the fever. LOL! Ok I’m officially awake now! I can see this gorgeous tulip as a fabric design, your color are awesome! Outstanding Jodi! I’m so glad you liked it Sharon! Thanks! Wow! Judi this is stunning. Love it. The colors look amazing. Have you read the book, Tulip Fever by Deborah Moggach? It’s great! That is one happy tulip. So gorgeous! Spring has sprung! very expressive and beautiful Jodi! wonderful movement and Vitality! great colors and pizzazz! full of light and joy of Spring! Thanks Debi! I kinda like this one… 🙂 Some things I’d change… but… Are you ever completely satisfied? I found, that I had to Teach myself ‘how to’ appreciate what I did do right. and then let go. Kind of difficult at first….. easier, later. Ah, purple ~ my favorite color! Beautiful. Thanks Carol! 🙂 Happy Purple! Fantastic Jodi. A vibrant and free painting of a tulip. Lovely poem as well. I love this! watercolor spontaneity — you can’t get any better. 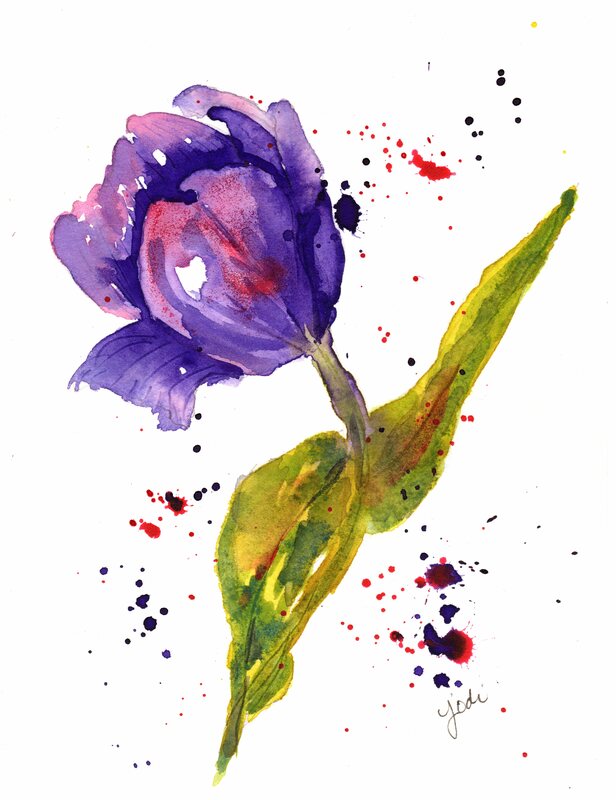 Purple + flower + watercolor = LOVE! Superb! Your colours are so lovely… and the way you applied them! So impressed! Your watercolour style is developing in really cool ways. And the way you drew the borders of your petals… so perfectly, delicately tulipy 🙂 . Tulips are the best part of spring! And your paintings capture their beauty perfectly! I love purple and I love tulips! This one is so pretty and special! Jodi, your painting suggest the season of planting and Easter. It’s wonderful.